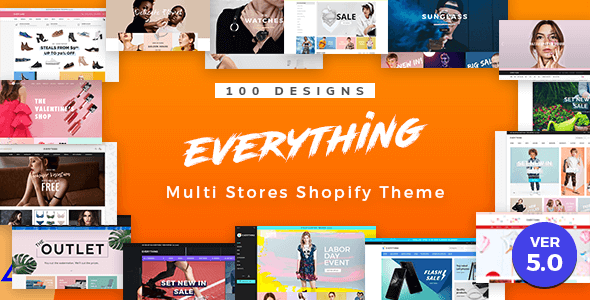 Everything is a Premium Multi-Stores Shopify Theme designed and developed by ThemeForest’s Elite Author. Theme is responsive, mobile compliance. W3C, HTML5, CSS3 strictly valid and compatible. The theme pack includes 100+ different creative designs ready to use. 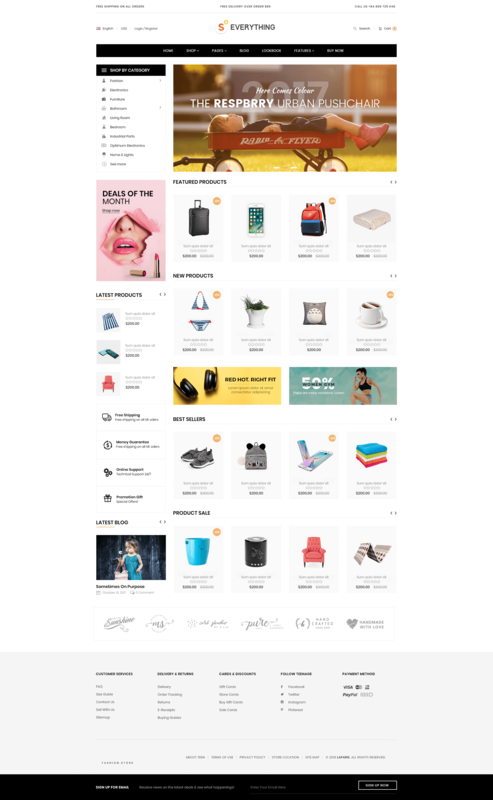 Include 29 Normal themes and 71 Sectioned themes (page builder) for VER 4.0 and new stunning 30 Sectioned themes for VER 5.0 . Everything support Oberlo App – starting a dropshipping business from Aliexpress. Any themes in Demo listing have “VER 5.0” label is 5.0 theme. 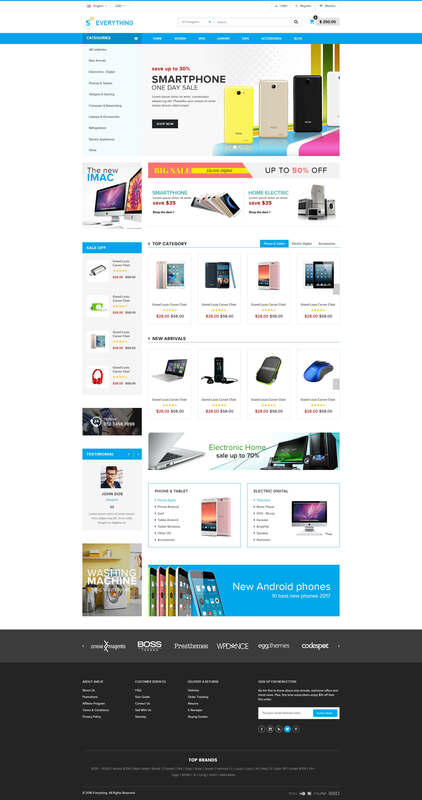 We will build the Dev site include all sample data (full store). Then we will transfer this Dev store into you. It’s Free service, so we don’t setup in existed store of Customer. Proxima Nova font: Everything demo used Proxima Nova font (from Typekit). This font is commercial font, so it will only work in our demo. Not included in theme packages download. Block and Sections: Everything have unique Home layout, So each theme will have different layout and the Theme Option (Sections) will only include sections (block/area) that use to build the unique layout. It do NOT include other sections (block/area) from other theme style. The theme support Translate Editor of Shopify. Help to translate the site to any language. But only show in 1 language in front-end. It does not support Multi-Language. If the store is not English language, after installation, you ned go to Actions > Edit Language to update language text fields. Shopify Apps: there are a lot of Shopify Apps released. So, we can not install all of they and test to make they work right in our theme. 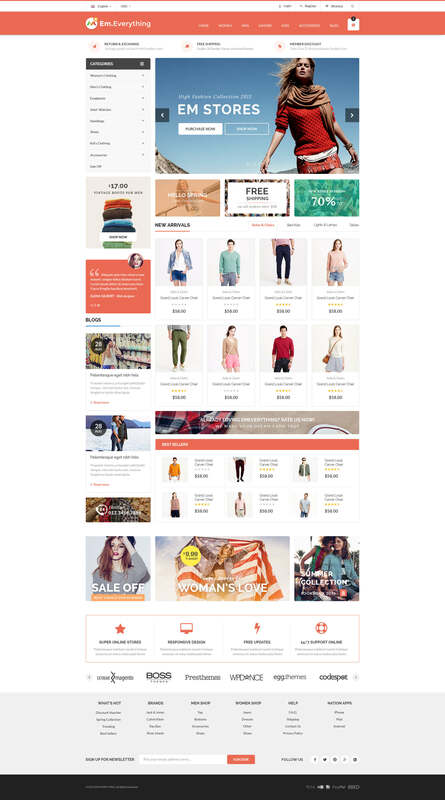 So, we will NOT warrant our theme will work right 100% in all Shopify Apps! Tabs in Detail page: only the Description tab and Review tab (used App) will show content different for each product. Other tabs as Delivery, Warranty, Payment will the same for all products. It caused by Shopify only allow have 1 Description field for each product and don’t allow add custom product field. Demo functions/features: Please check our demo clearly about functions/features. Some function is unique and only work in some demo style. We will only provide support about the function that show in our demo. When you request include unique function to other demo, we will not support it. Source Syntax: we will provide support anything that the theme package in Customer site not the same our demo. We don’t support (complex requests) to add new element such as SEO text, Robot text, Schema.org ,...!